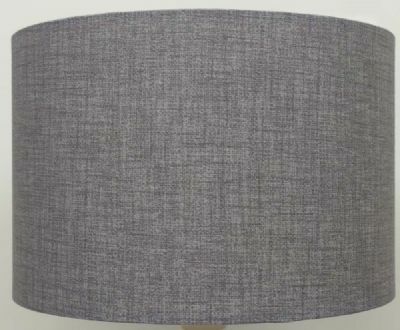 Size 8" 8" Long 10" 12" 14" 16" 18"
You are bidding on a NEW Linen style Cylinder / Drum Lampshades. Each shade is hand made and has a rolled edge for a clean finish. The shade can be used for either a Ceiling light or a table lamp / Floor lamp. A full range a sizes are available, as detailed below. If you need something shorter or longer please email and I can sort out for you. I also have diffusers listed on my other auctions which are suitable for these shades. I can even do something larger if you wish just send me an e-mail. Diameter 8" (20cm) Total Height : 7"
Diameter 8" LONG Total Height 10"
Diameter 10" (25cm) Total Height 7"
Diameter 12" (30cm) Total Height 8"
Diameter 14" (36cm) Total Height 8.75"
Diameter 16" (40cm) Total Height 9.5"
Diameter 18" (45cm) Total Height 10"
European Fitting (40mm) with a British Adaptor (28mm), so will fit all types of lampholder. The photo's appear differently on phones, tablets, crt's etc, If you are in any doubt PLEASE ASK FOR A SWATCH !!!!!. What you see is what you pay !!!! Welcome to the New and updated Lighting Warehourse website. In the coming weeks we will be adding loads of new designer lampshades, made using the latest fabrics.